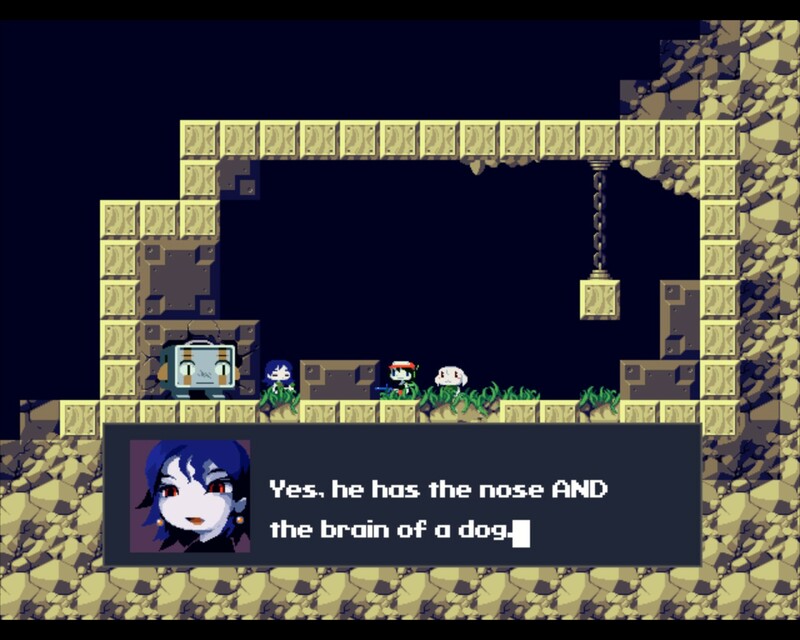 In addition to the original version, Nicalis worked with Amaya to create updated character designs and enhanced graphics and music, arranged by Yann van der Cruyssen. The WiiWare version contains several exclusive gameplay modes, including Boss Rush, a Sanctuary time attack mode, and the ability to play through the game as Curly Brace. 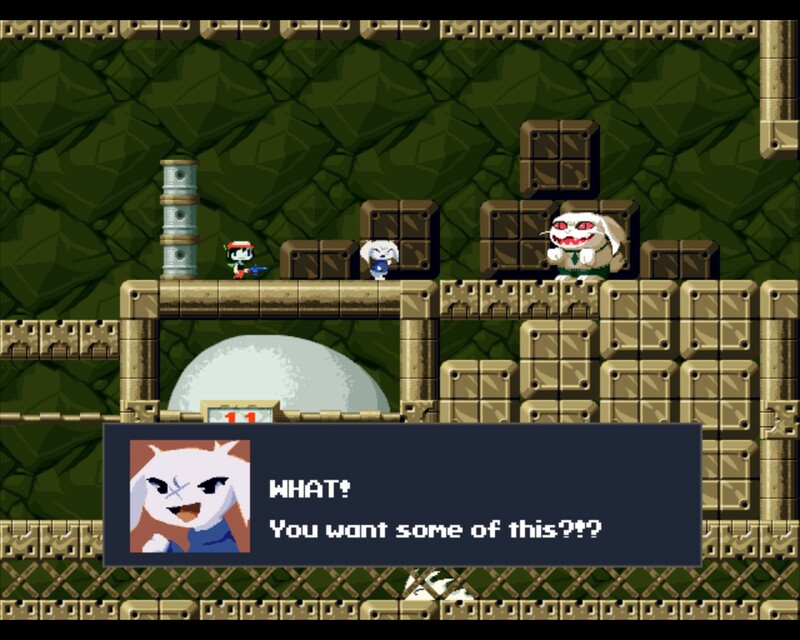 The Steam port, titled Cave Story+, features a new level called "Wind Fortress" as well as the new gameplay modes from the WiiWare version. I decided to start on Normal Mode. There is no tutorial. After some fumbling, I determined at first there's only left and right for horizontal movement, A (Gamepad) for jump (hold to jump higher), and down for collecting items, opening doors, and talking to people (action button). Then soon enough you get a gun with limited range and you press B (Gamepad) to fire. Tip: When you run out of air, you die (unlike Terraria, where when you run out of air, you start taking damage). Tip: Your jump is limited to one block high in water. Tip: You can shoot up. Tip: You can shoot down. Tip: When you use the heart box in a save room, your life and magic missiles are refilled. Defeated the boss at the end of Egg Corridor. I think his name was Igor. So X and Y (Gamepad) are used to rotate through your weapons. The weapons get upgraded with experience. You have to be holding the weapon to upgrade it. I eventually got the hang of switching to my the magic missile just to upgrade it and the switching back to the default gun. 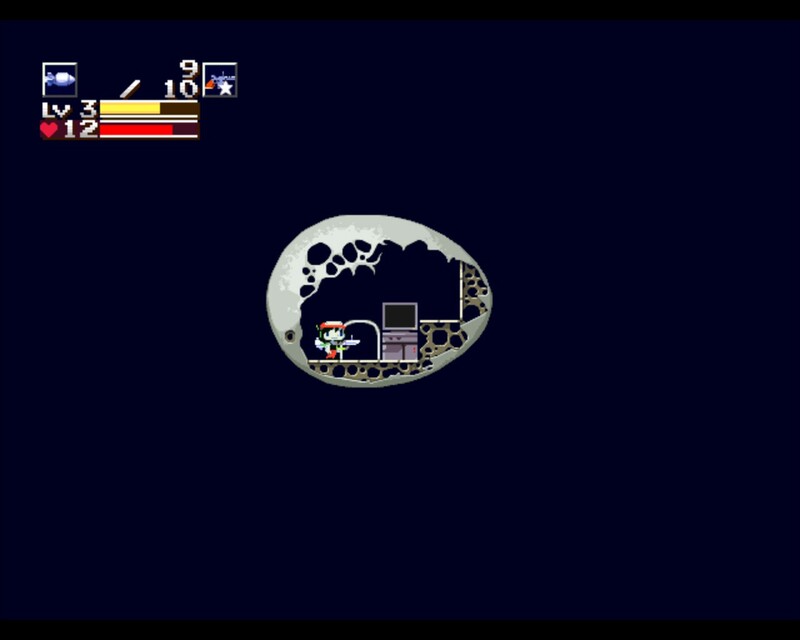 So far, the gameplay so far is pretty standard, as far as platformers go. There's a little more movement available than old 8-bit platformers, but there remains a reasonable restriction. I have a feeling upgrades will be available. Actually, the collection of heart capsules and roaming the world gives the game the modern 2D Metroidvania/Castleroid feel: non-linear exploration and as you gain abilities you can explore more of the world. At the moment, however, the game does seem straightforward and linear. Nevertheless, it develops a strong story and I love the soundtrack. Tip: Save often. You never know when you're gonna die for some silly reason.